Katy over at Kansas Couture inspired me to do an end of the year giveaway! I don't know about all of you but I am very excited for the new year. New beginnings, new adventures and more opportunities to live life to the fullest. So in honor of new beginnings, I'm giving away one of my Paris Antique Cream Pearl and Chain Necklaces! 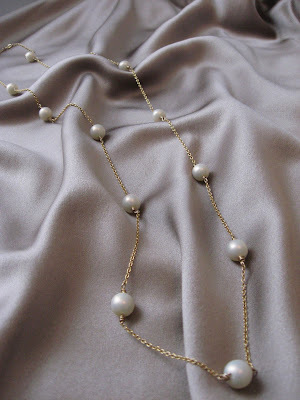 Its made with 14K gold plated chain and clasps, lovely antique cream glass pearls, and is 38 inches long. Leave a comment below with your name and email to enter (by 12pm central Dec 31,2009), and I will draw one name on January 1st 2010!! If you would like additional entries you can Follow me /subscribe to my blog for +1 additional entry. You can also blog about this drawing or my shop for +2 additional entries. Just let me know what you did in the comments section. I wish you all a wonderful holiday season and all the best of fortune in the New Year! See you in 2010! You've been in my google reader for a long time now! That's gorgeous! I can't wait to visit your Etsy store-- I am so addicted to that site. Oh I love LOVE this necklace. Have a wonderful holiday! Wow, this is beautiful!!! So exciting! Please enter me and have a wonderful Holiday! instead of following you, can i add you to my sidebar? lovely necklace love the pearls classic beauty. Oh it's beautiful! I love anything with pearls. They're so classy. What a great necklace! I love pearls :-) they never go out of style. I hope I win! I wore pearls at my wedding this summer & will forever associate them with the best day of my life!...what a fresh take on a classic style! Thank you for hosting such a fabulous give-a-way! Lovely necklace. There's something about wearing pearls that ups the sophistication of any outfit, including jeans and t-shirt. I think, too, that a long necklace that intersperses the links with pearls is a sassier, more modern alternative to a prim short necklace. Amazing! What a lovely way to start the new year! Ohhhh how fabulous! Happy Holidays!! This necklace is beautiful! 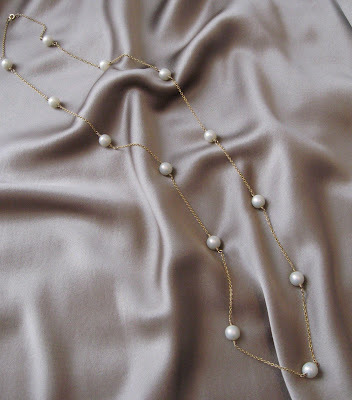 Pearls are my favorite, I am in love with this necklace! Gorgeous! I love seeing fellow Kansans' creativity and talent. I am a new Reader subscriber! Found this through Kansas Couture - beautiful necklace! And just started following you through google reader, which I also just learned what it was! haha. What an elegant and classy necklace! Love it! BTW, your "When Deco met Pearl..." necklace is STUNNING. Gorgeous necklace, very classic! I'm a new reader, and I love what I see so far! I just started to follow you, so I can't wait to see what's new in 2010! this is a lovely, classic, necklace! Gorgeous! Thanks so much for the opportunity! That's really pretty! Thanks for the giveaway! I also just became a follower! Awesome necklace - thanks for the opportunity!! O.o I can't believe you are giving away that necklace... well, lucky us! This necklace looks so priceless! It really looks beautiful! That's lovely. Thanks for the chance. Beautiful and timeless. I now follow your blog (+1) and put a link back to this post on my side bar (+2?). This is beautiful, PLEASE enter me!!! I am in love with your jewelery - You have lots of talent! beautiful! please count me in! I signed up to follow you to see what else you do. (I'm really impressed by what other people can do, it's amazing. My handmade stuff is nice, but it's also obviously homemade). Thank you for the opportunity to enter.... the necklace is beautiful! Beautiful! I need a wardrobe makeover and this would be the perfect piece to kick it off. That is a very classy and pretty necklace. This is such a beautiful necklace. Please enter me to win. OOh, I have been wanting a necklace just like that!! Enter me!!! Love, love pearls! Thanks for the giveaway! Wow, this necklace is stunningly beautiful! Thanks for holding this giveaway! That necklace is soo pretty! It would match everything and dress a casual outfit up so quickly and easily. Thanks for this amazing giveaway! I would LOVE to win this for my sister! Thanks for the chance! OH that's so lovely, I love pearls. Thank you for such a lovely giveaway. Happy New Year! I'm following your blog, Following as Sihui. OOps, sorry about the previous comment.. I forgot to write my name and email! I'm following you through blogger! Pleaseeeeeeeeeeeee enter me, I love to wear necklaces and yours is just gorgeous! Such a absolutely stunning necklace! Beautiful necklace. I follow your blog! ahh, this is absolutely stunning!! Gorgeous! Would love to win! :) Thank you!! Your necklace is exquisite & I would thrilled to own it! What a creative eye you have!! Oh wow!!! Fingers crossed so beautiful! I can't wait to visit your Etsy store-- I am so addicted to that site. Jewelry designer. coffee lover. Here are my inspirations.. I hope that some of them inspire you. It leads to transformation of dust into pure gold"
from Journey in Yourself, Journey out of self.